Which of this year's candidates for the Best Visual Effects Academy Award do you think should take home the Oscar? Go behind the scenes of the five Academy Award nominees by clicking on the embedded video players below; then, be sure to vote in our poll on which you think should win! This Wired magazine video featurette (above) explores Industrial Light & Magic's 3-D computer animation for the crashing helicarrier. ILM also released a reel (below) of just a tiny fraction of the film's nearly 900 FX shots, incorporating 3D CGI, digital environments, and green-screen stage photography. This is Dan Sudick's seventh Oscar nomination; he'd previously been nominated for "Master and Commander: The Far Side of the World," "War of the Worlds," "Iron Man," "Iron Man 2," "The Avengers and "Iron Man 3." Earl previously received visual effects nominations for "Transformers" and "Star Trek." Grill was nominated for "Hereafter." "Captain America: The Winter Soldier" marks DeLeeuw's first Oscar nomination. 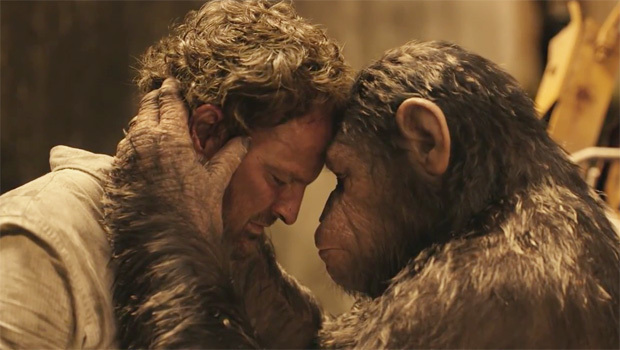 This video feature from Weta Digital explains how the creation of digital simians in the "Apes" franchise has evolved since "Rise of the Planet of the Apes," from motion capture to rendering fur in rainy environments, to building a post-apocalyptic San Francisco. This is the ninth Academy Award nomination for Letteri, who has won four Oscars (for the "Lord of the Rings" chapters "The Two Towers" and "The Return of the King," "King Kong," and "Avatar"). Lemmon and Barrett were previously nominated for "Rise of the Planet of the Apes." This is the first Academy Award nomination for Winquist. VFX house Method Studios produced this breakdown reel of shots, showing the compositing, green screen and animation work from the latest Marvel Comics adventure. Aithadi was previously nominated for "Harry Potter and the Deathly Hallows, Part 1" (2010). This is the first Oscar nomination for Aithadi, Fawkner and Corbould. For more nominees, and to take our poll, click to page 2. This featurette (above) about the theoretical plotting that went into the design of the wormhole in "Interstellar" contains a generous helping of stunning shots from the finished film. Variety also produced a video containing interviews with the FX team and cinematographer Hoyte Van Hoytema about designing the film's worlds. Finally, below, a clip in which the crew's ship passes into and through a wormhole. Franklin and Lockley won the 2010 Academy Award for Nolan's "Inception." Franklin was also nominated for "The Dark Knight." This is the first Oscar nomination for Hunter and Fisher. Above: Digital Domain's process for transforming Jennifer Lawrence's character Mystique is detailed feather by feather. We also see how Magneto razes an entire stadium. Below: Inside the kitchen sequence, in which Quicksilver manages to outsmart foes through his time-bending acrobatics. Stammers was previously nominated for Ridley Scott's "Prometheus." This is the first Oscar nomination for Pecora, Crosbie and Waldbauer. "Interstellar" "Captain America: The Winter Soldier" "Guardians of the Galaxy" "Dawn of the Planet of the Apes" "X-Men: Days of Future Past"